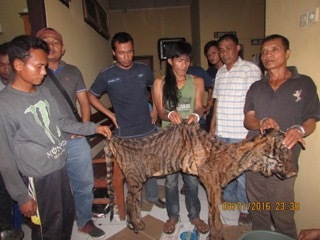 Apart from forest loss, poaching is one of major threats to the rare Sumatran tiger and its prey. David Macdonald reports on the remarkable dedication, and bravery, of practical men working to protect tigers in the tropical forest of West-Central Sumatra. A remarkable new paper published as a result of fruitful collaboration between Fauna & Flora International’s Indonesia Programme, Indonesia Kerinci Seblat NP Management Authority and WildCRU, made possible by a grant to WildCRU by World Animal Protection has explored the effectiveness of a longstanding Tiger Protection and Conservation Programme in Kerinci Seblat NP. Analysing a remarkable log of ten years (2005-2014) records on the activities of Tiger Protection and Conservation Units (TPCUs) the first thing that became clear was the gruelling nature of the work: six units have intensively patrolled nearly half of the 1.4 million hectares of national park forest, a total of 757 anti-poaching patrols had been conducted on foot totalling 3,713 patrol team days and 13,947 km walked. This huge effort paid off: the teams detected and destroyed 231 tiger snare traps and 3652 prey snare traps. 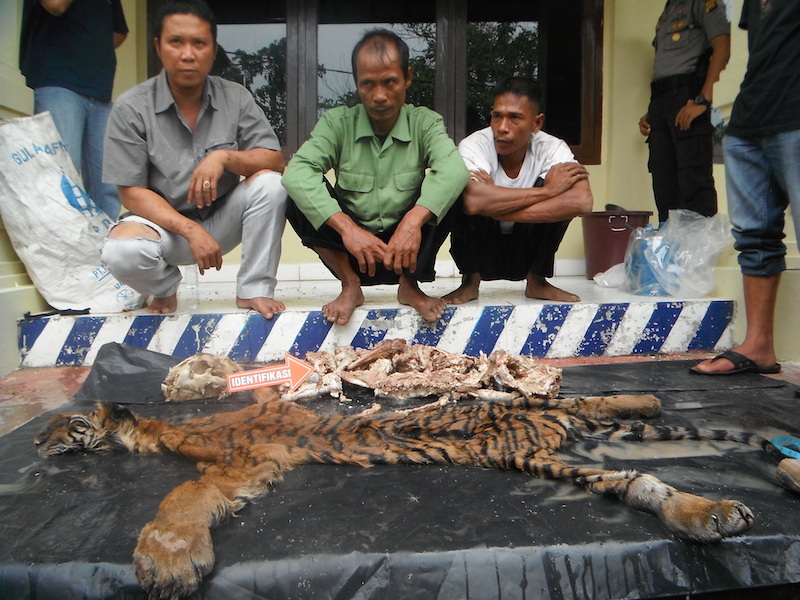 What is more 619 active investigations into tiger poaching and trade were conducted, with an average of 62 investigation reports per year that led to 24 law enforcement operations that resulted in 40 suspected tiger poachers (n = 19) and traders (n = 21) being arrested, of these, 37 suspects were found guilty and prosecuted. This project puts boots on the ground, and it pays dividends. Alarmingly, the teams in under a half of the park, the teams documented information on the snaring of 24 tigers (not to mention sun bears and other carnivores). Furthermore, in the quest for sociological insight into the poachers’ minds, a detailed analysis revealed a peak in poaching for the two months before a major religious festival – when the demand for meat increases and hunting deer is an available option. Also alarming was the leniency of the punishments given to the criminals these dedicated patrolmen brought to book: while Indonesian Wildlife law allows a maximum 5 year sentence and fine equivalent to USD 7,600, our study showed that the average sentence was closer to one year, and a fine of USD 107. An important conclusion, therefore, is that it is important to not only continue investing in the TPCUs but also in the training of prosecutors and judges.